The Hobbs Sisters bring a killer combination of big voices, twin sister harmonies and high-energy performance to the stage. Whether headlining shows in the Pittsburgh tri-state area or opening for national country acts, they are making a name for themselves as singers, songwriters and entertainers. The sisters have opened for many national acts including Lady Antebellum, Brett Eldredge, The Swon Brothers and Aaron Tippin. In 2014, they shared the stage with Jana Kramer, Maddie & Tae, Cassadee Pope and Rae Lynn as part of Y108’s Girls with Guitars event in Pittsburgh. 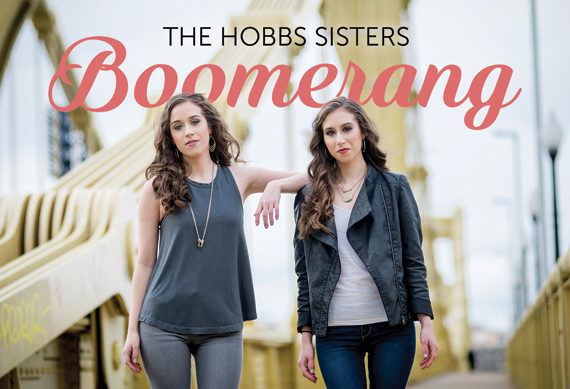 Sibling harmony is the defining feature of The Hobbs Sisters’ sound in both their live performance and the songs they write. Their second album, Love Hangover, was released on June 10 and features five harmony-driven original songs. The new single, “Boomerang”, highlights their signature vocals and unique country sound.